LiveView - remind you of any iThing? 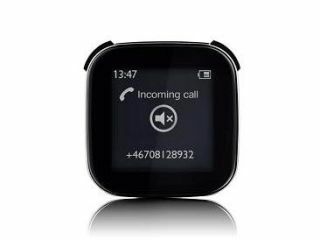 Sony Ericsson has announced that its LiveView Android Bluetooth wearable accessory will be available for around £60. The 1.3-inch accessory garnered a good deal of attention when it was showcased by the company, bringing a remote control that means your phone can stay in your pocket for some of the simple tasks like checking mail, social networks and seeing who's ringing you. With the LiveView only working with Android 2.0 handsets and above, Sony Ericsson will delay until it has updated its Xperia X10 to a later operating system. The news of a possible November release date – and the European pricing of €69 was unveiled on French site Journal Du Geek. We're all for novelty phone accessories, but we're still not sure if we'll be wearing this on our wrist, around our necks in some kind of uber-geek pendant method or, most likely, we'll end up losing it down the back of the sofa and going back to more traditional phone usage.